Quick Note App is a free note taking application for the users of Windows 8 to quickly note down or create a note of anything important that hits their mind while working. This note taking application also allows the users to keep a record of their notes taken by adding date and time to notes. So you can easily access your notes on the basis of date and time without any confusion. With Quick Note App for Windows 8, you can create unlimited number of notes and you can even give a suitable heading to your note. This note taking app even allows you to choose your preferred color from the available colors for the note taking page with a single click on color option. This note taking application also gives you options like select all, undo, cut, copy, and paste. While creating notes, if you make a spelling error, then this application alerts you by highlighting that spelling mistake and gives you various word suggestions related to that particular spelling error word. By mistake if you close the note, then no need to worry, because your note will be automatically saved on Quick Note App. And you can do further editing in your notes with a right click on edit option below. 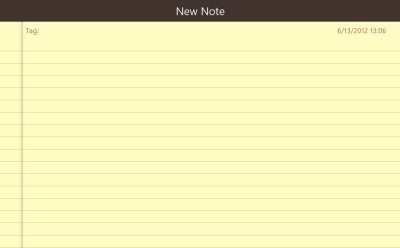 The good part is that, this app is capable enough to display your note on the start screen along with other tiles. For this to happen, you need to select a note by right clicking on it and hit the Pin to start option. Don’t forget to check out our recent post on Ganna App. Lets you to create your own notes. Shows date and time on the created notes. Enables you to select any color for the note taking page. Spell check function is present in this note-taking application. Makes your note appear as a tile within the start screen. 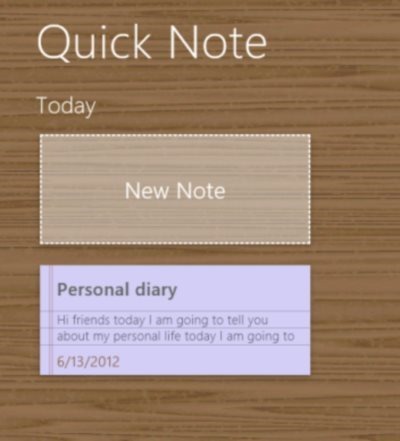 Quick Note App is an excellent app for Windows 8 users which enables them to create their notes instantly. Try this free note application from Windows 8 app store.